The fourth and final day of the 11th St. Barth Cata Cup was expected to be decisive, at least for second and third place. But things turned out completely differently than anticipated. The reason? A huge mistake made by the Greeks, Iordanis Paschalidis and Konstantinos Trigonis (St Barth Assurances). In fact, well on their way to a fifth straight race win, and first place in the overall rankings, the current world champions took the marker in the wrong direction. A mistake they won’t soon forget as it pushed them from first to fourth place. Yet this error worked to the advantage of duo Enrique Figueroa and Ruben Booth (Nikki Beach St Barth), winners of the “MARCHE U” Grand Prize, and especially for the tandem of Patrick Demesmaeker and Olivier Gagliani (Les Perles de St Barth), who at the end of the day, shot to the top step of the podium and became the big winners of this regatta, repeating their 2015 victory. They have now joined Misha Heemskerk and Eduard Zanen in the very small circle of double winners for this event. Winds between 15 and 18 knots, seas much calmer than earlier this week, and a big tropical sun: this third day of competition for the 11th St. Barth Cata Cup saw almost ideal sailing conditions, allowing the committee to launch two great races. Both were hard-fought but finally won by Greeks Iordanis Paschalidis and Konstantinos Trigonis (St Barth Assurances) who, since their unfortunate error during the first race, which earned them an 11th place, have been seemingly untouchable. In fact, these current world champions have been sailing perfect races. So this evening they are not only the winners of the Grand Prix “ST BARTH ASSURANCES-ALLIANZ,” but have also moved to the top of the provisional ratings, making a serious bid for an ultimate victory. Yet to succeed in that bid for a second consecutive win, the title holders have to remain vigilant, because hot on their heels, the competition is coming on strong. The proof is in the pudding: the five top boats in the overall ratings are within 11 points. Which means that the final race on Sunday, from Saint Jean to Public, will be the deciding factor. Regatta Gets Off To A Flying Start! Among the 102 sailors taking part in the 11th edition of the St.Barth Cata Cup, which set sail on Thursday November 15, there are both professionals and amateurs, athletes from the four corners of the globe. Among the amateurs is Léo Jordil, whose father Vincent is one of the original organizers of the regatta. This year is the first time that Léo’s busy schedule has allowed him to participate in this event, and for his baptism by fire, the Saint Barth native chose Arnaud Camoin as his partner, although they usually sail together on a very different kind of boat, the 15 M JI Tuiga, flagship of the Yacht Club de Monaco. An 11th Edition That Promises To Be Vigorous! After a day dedicated to preparing boats, confirming registrations, and training, the 51 crews representing the 11 nations participating in the 11th edition of St.Barth Cata Cup are ready to set sail. In fact as of Thursday, at 10am, they will attack the first race of the challenge. A challenge that promises to be especially vigorous, with winds coming from the east at 20 to 25 knots—at least for the first two days of the competition. Enough to guarantee some stylistic fireworks as well as a great show put on by the grand champions such as the Greeks Iordanis Paschalidis and Konstantinos Trigonis, current world champions back to defend their Cata Cup title, and at least 10 other duos who would like to give them a run for their money and take first place. And yes, this year once again, the level of the competition is very high, and the expected high winds could create some unexpected surprises. The Roster Gets Better And Better! With the 11th edition of the St. Barth Cata-Cup setting sail just a month and a half from now, the organizers are getting everything ready to properly welcome the competitors. In Europe, on the last Friday in September, nine boats were loaded into a sea container that left Hyères to cross the ocean toward the Caribbean, while two other large metal cases with a total of 19 Formula 18 cats will be ready to leave on October 10 from Gravelines. The plan is for them all to arrive the week before the regatta in Gustavia. This is perfect timing so that the 55 duos registered to date, as well as two tandems with wild card status—Mitch and Rita Booth and Enrique Figueroa and Ruben Booth—to get their bearings out on the water before moving on to the more serious task at hand. The 11th Edition On The Horizon! 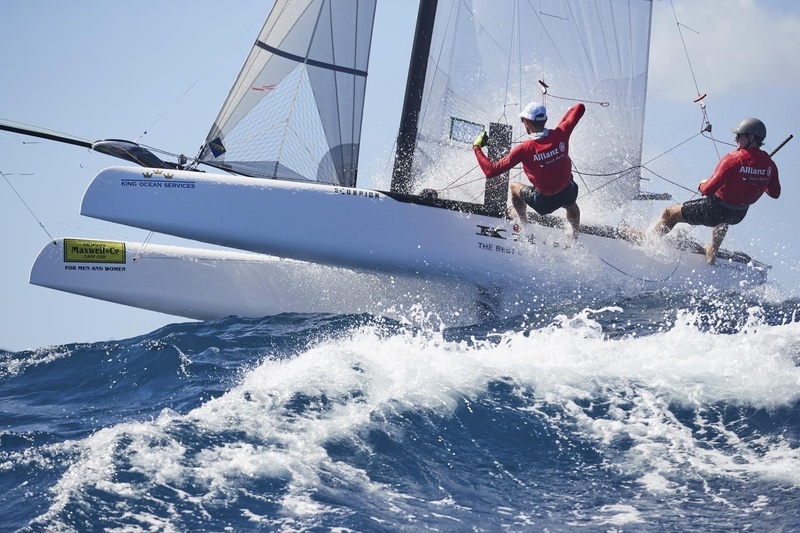 The 11th edition of the St. Barth Cata-Cup takes place on November 14-18, 2018. 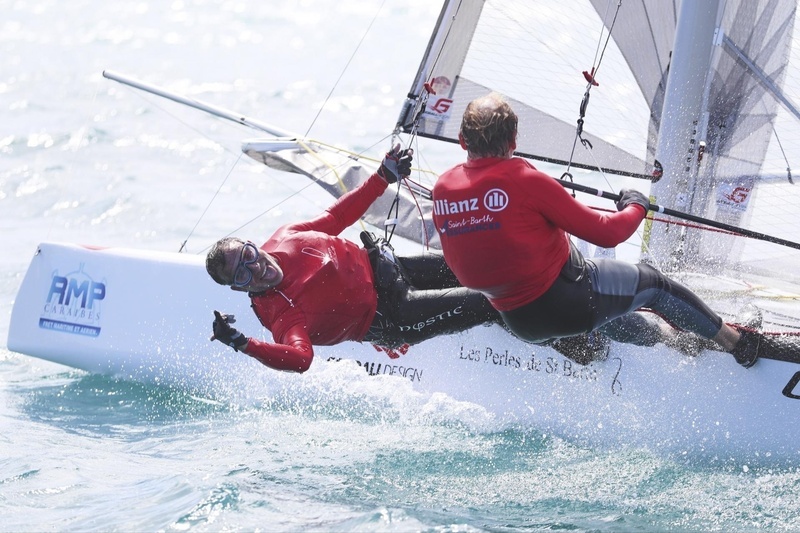 There are already no less than 55 crews representing 14 nations that have confirmed their registration for this event that is reserved for Formula 18 catamarans. Among them, there are those regulars who would not miss this regatta no matter what, such as Emmanuel Boulogne, Patrick Demesmaeker, Olivier Gagliani, Pierre Le Clainche, Antoine Joubert, and the duo of Iordanis Paschalidis and Kontantinos Trigonis, who would like to once again sail across the finish line in first place. There are also “smaller newcomers” attracted by the concept and the resoundingly convivial ambiance of this competition—a competition perfectly scheduled on the racing calendar to allow, on one hand, participants to finish their season in the tropical sun, and on the other hand, launch the island’s tourist season in a great way.